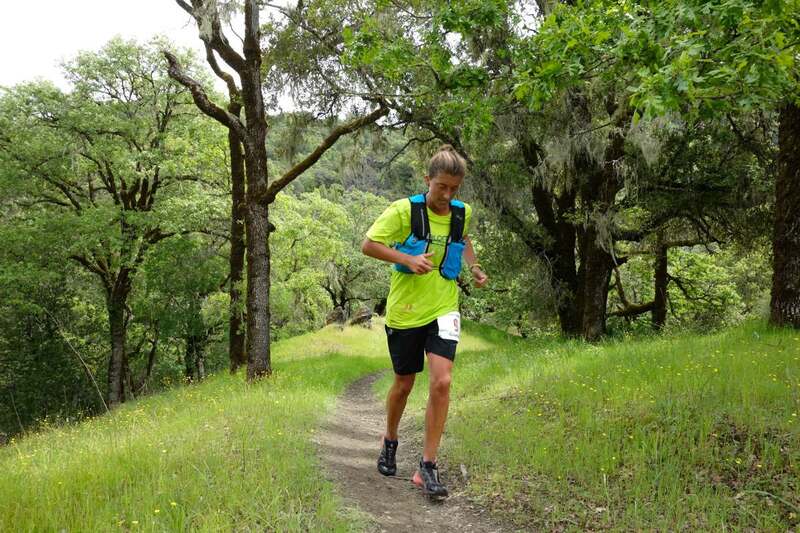 The 2017 Lake Sonoma 50 Mile went off without a hitch on the relentless hills above Lake Sonoma west of Healdsburg, California. Some muddy patches and a small but steep reroute meant that for the first time in the race’s nine runnings, neither the women’s nor men’s fields saw a new course record. Still, the women’s race saw YiOu Wang run a wire-to-wire defense of her win from last year, while Kaci Lickteig and Magdalena Boulet ran the entire race together in second. On the men’s side, Sage Canaday led from the race’s midpoint with Dakota Jones never falling far behind, and the pair ultimately finishing one-two. Read on below to find out more fully how the women’s and men’s races unfolded. 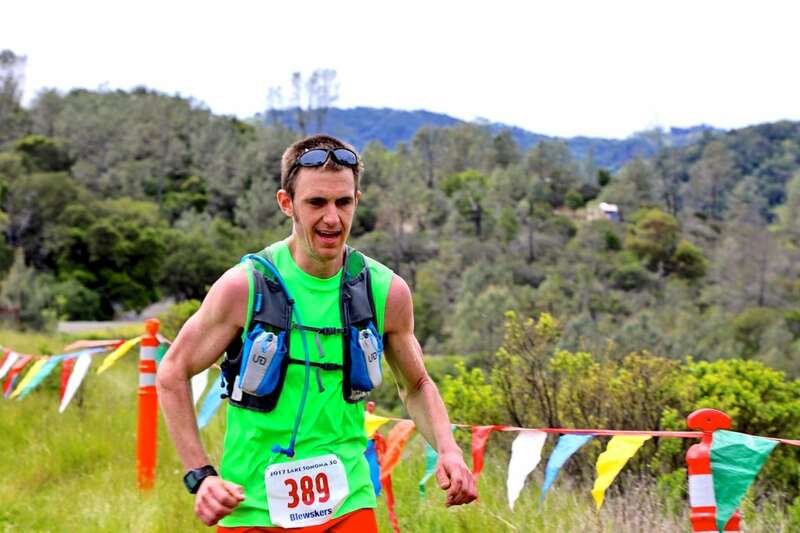 Many thanks to Nathan for their generous support of our coverage of this year’s Lake Sonoma 50 Mile. 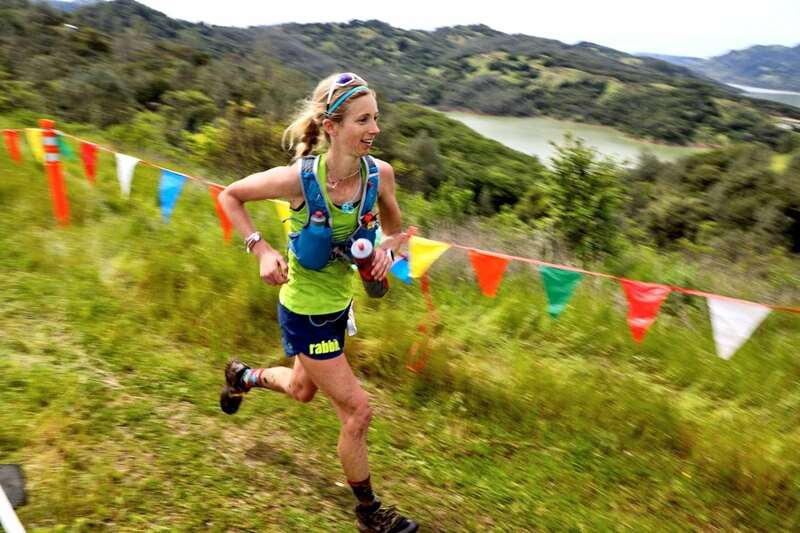 The 2017 women’s field amounted to large group of ladies with diverse backgrounds and skill sets–previous Lake Sonoma champs, Western States champs, long-distance specialists, and more–a set-up for a truly fascinating women’s race. 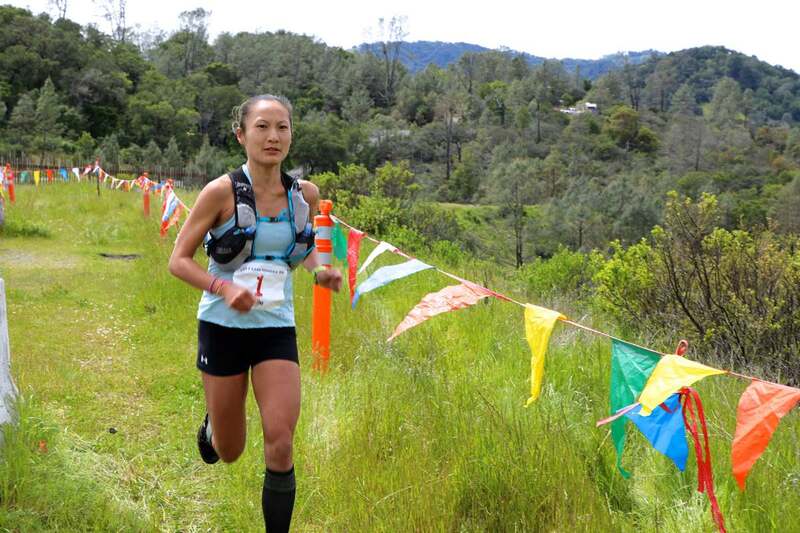 When we caught a glimpse of defending champion YiOu Wang (pre-race and post-race interviews) before the race start, it seemed clear that she was all business and here to get the dueling jobs done of running for the win and earning a Western States entry in this final race of the Altra Golden Ticket Series. 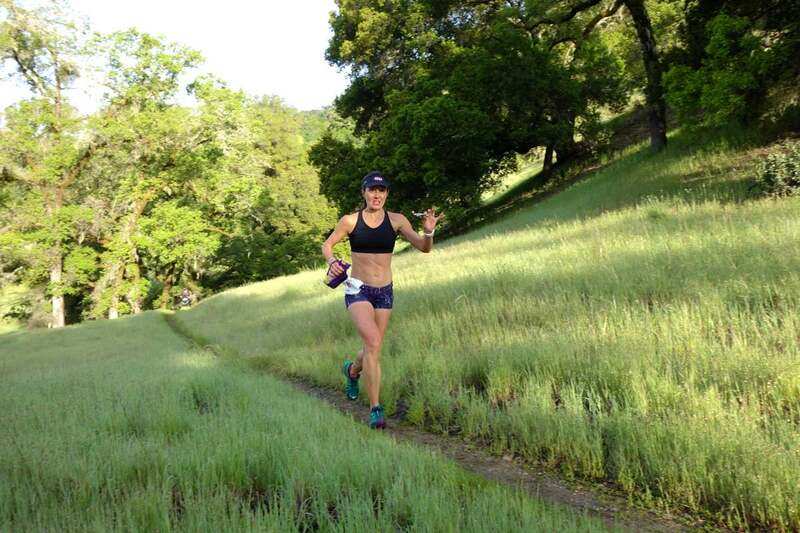 YiOu ran the entire race off the front, picking her way through the men’s field even, until she finished as champion for the second time, ninth overall, and in possession of a spot in this year’s Western States field. Her 2.4-mile split was 16:57 elapsed, which is 7:04 minute-mile pace, and from there she just kept pressing on as the terrain allowed. Her 7:24 finishing time–what amounts to 8:53 minute-mile pace on a course with some 10,500 feet of climbing–did not match her 2016 winning time, but was probably a nearly equal effort given the course’s reroute and muddy conditions. Somewhere in the first couple road miles, Kaci Lickteig (pre-race and post-race interview) and Magdalena Boulet (post-race interview) fell into step with each other, and, seriously, the rest is history. The pair would later say that they somewhat unintentionally ran together until the halfway point, and, then, they began to intentionally work together, with Magda adding her strength to pull the pair up the uphills and Kaci using her strength to help them find another gear on the downhills. Every aid station, the pair entered and left together, full on hamming it up for volunteers and fans. They were legitimately having a good time. 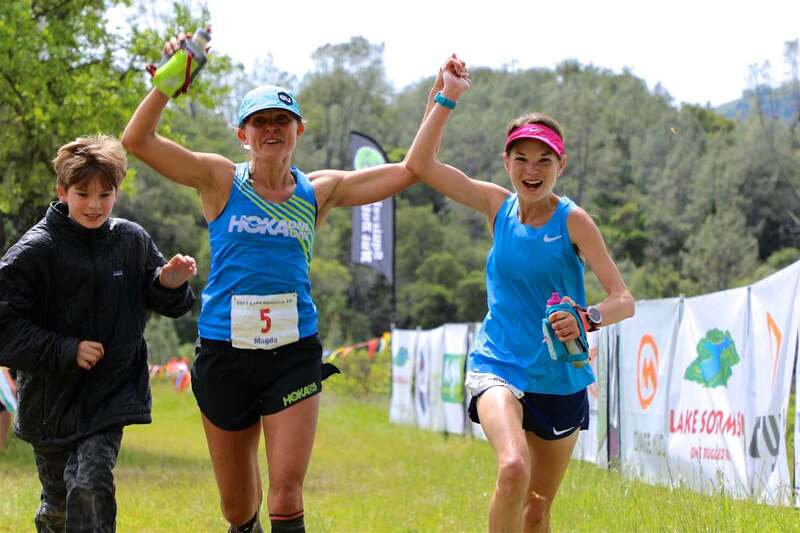 In the end, the pair crossed the finish hand-in-hand, Magda earning her Western States spot and Kaci, who did not need a spot in Western States as the reigning Western States champ, overwhelmed with happiness. It looked like a good day in paradise for this pair, and it was one of the finest examples of competitors working with each other that I’ve personally seen in trail running. Every time we saw Courtney Dauwalter–at mile 2.4, 11.6, 19.5, 25, 30, 38, and 45.5, phew!–she was in fourth place. She ran fleet footed and metronome-like–you could see why she’s the 24-hour American record holder, able to hold steady effort from start to finish in an event. Julia Stamps Mallon, sixth a year ago here, moved up a spot to finish fifth. With five or so men with great leg speed from track-and-field and road-running careers in this field, everyone expected the men’s race to go out hot, and indeed it did. A lead pack of five men–Jared Hazen was setting the pace with Ryan Bak, Chris Mocko (pre-race and post-race interviews), Patrick Smyth (pre-race interview), and Sage Canaday (pre-race and post-race interviews) all together–split the first 2.4 road miles at 6:06 minute-mile pace, hit the trail, and just kept rolling. Dakota Jones (post-race interview) was just a couple seconds later leading a long string of chasers. Mile 11.6, some nine miles of singletrack later, saw little change in the lead pack of five, except that Dakota joined it while Chris dropped back by two minutes, saying later that he struggled to keep the pace in the early climbing. The lead men hit mile 11.6 in 1:19 elapsed, which works out to 6:48 minute-mile pace. They were still flying. Rolling singletrack eventually gave way to fire roads as well as a couple longer climbs and descents between miles 18 and 31. This totally shook up and wrung out that lead men’s pack. Sage would emerge at mile 30 with a 90-second lead over Dakota and a five-minute gap on third place Chris. These three men would remain in these positions all the way through the finish. Between miles 30 and 38, the gap between Sage and Dakota increased to three minutes, 45 seconds, and I began to think that the rest would be history. Anything’s possible in ultrarunning, though, and at the mile 45.5 aid station, Dakota was arriving just as Sage was leaving, their gap at about one minute. Both would later say they were suffering in that last section due to the race’s fast early pace, but Sage was able to hold off the stalking Dakota, and they went one-two at the finish. Chris rallied from his early race difficulties to finish third. Sage’s final time, 6:17, was five minutes off his fastest time here in 2014, and works out to 7:32 minute-mile pace. I’m guessing the course reroute and mud more than attributed to Sage’s slightly slower time compared to the past. 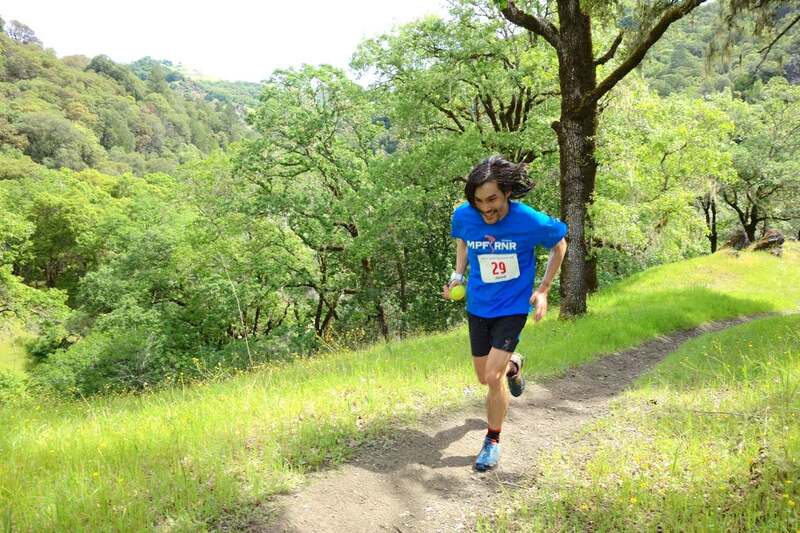 I’ve watched these guys race Lake Sonoma for years now, and I’m always impressed that they are able to keep this kind of pace on the constant hills and arrythmic nature of this course. Early race leaders Jared Hazen, Pat Smyth, and Ryan Bak dropped due to various injuries and issues. The balance of the men’s top five were the guys who ran more moderate efforts in the race’s first half and emerged into their positions in second half of the race. Zach Szablewski took fourth and Jared Burdick fifth. 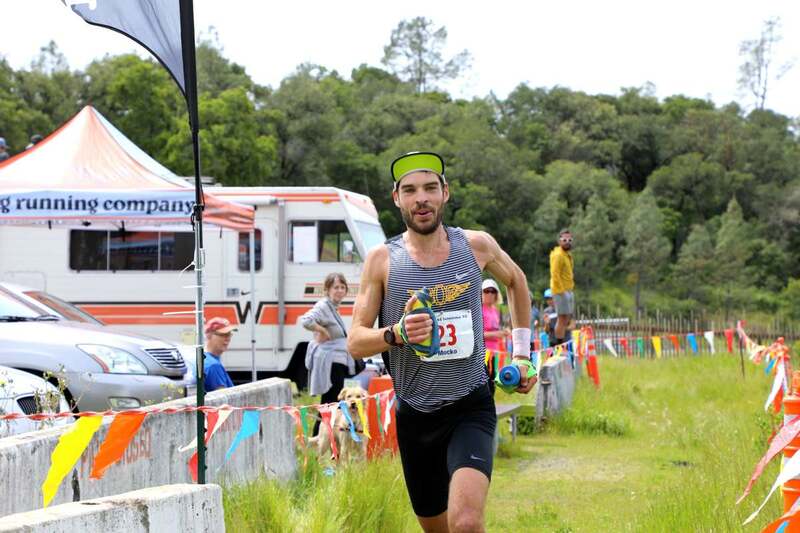 At the time of this writing, we understand that both Sage and Dakota will forgo their Golden Tickets, and third place Chris already has an entry from his top-10 Western States finish last year. The series rules allow the tickets to roll down as far as fifth place, so it looks like Zach and Jared will be offered Golden Tickets. More fruits of the labor of their consistent efforts start to finish. Thanks to Pam Smith and Jon Murchinson for providing from-the-course updates! they should race until the end…not held hand..
And then for this page to encourage it and talk about it as a good thing? I hate it so much. Next time just do a fun run if you’re not going to race. Trevor and Stan: they are people, not paid performers. It’s a bit rude and presumptuous of you to demand that they run how you want them to run. Are you their coaches? Their sponsors? Please go and watch their interview with Meghan Hicks. They had a great time and put in a really solid performance. Your point about these runners not being paid performers is one that’s come to my mind when this and other past ties at the front of the sport have occurred. This isn’t a professional sports star tanking the championship game that someone paid $500 to attend. It’s a couple runners making the most of an event in whatever way means the most to them. We all have different motivations for running broadly as well as for running a race. One of my greatest memories in 25 years of running was spending 70 miles of the 2006 Western States 100 with my ultra mentor Scotty Mills. At various times on a trying day, one of us would be yielding a bit to stay with the other. One of us could have pulled away over the final 10 miles or the last 100 meters, but why? To gain one position at the expense of seeing out what was a great joint experience? No thanks. Not on that day. On other days, I’ll have other motivations and other ways of maximizing what the experience means to me. That’s the thing, we participate in these events for ourselves and our own reasons. Why not embrace that. 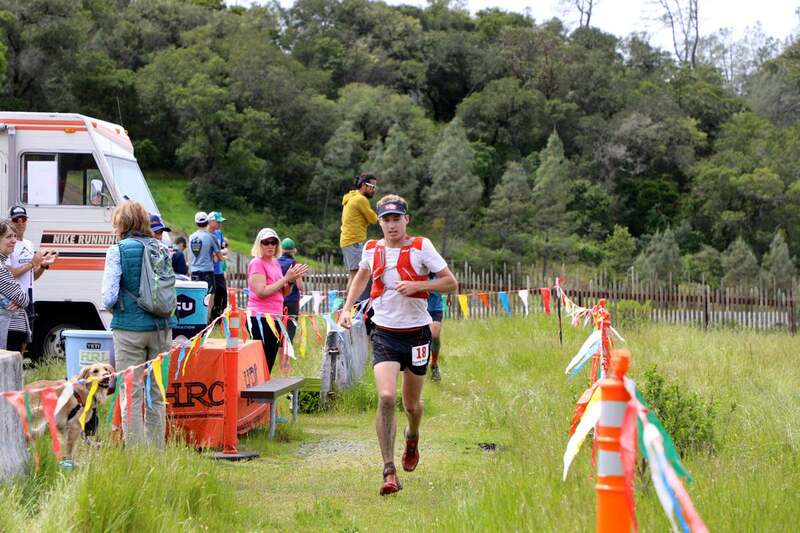 It’s inspiring to see Zach Miller sprint and lean across the Lake Sonoma finishline when no one else is in sight. It’s just as inspiring to see Kaci Lickteig and Magdalena Boulet share a great day on the trails and eek every last second of joy out of it. Why in the world is it acceptable and fair for these two seemingly capable athletes to pace each other for the majority of the race?! But worse, it’s been commended and spotlighted as a good thing for our sport. I would be outraged if I was the 4th place finisher who was cheated out of a podium spot and a golden ticket. They should both be disqualified. If you can’t respect the rules and run a fair race, then don’t toe the starting line. The pacer point is actually kind of valid if you view it from that angle I’ll admit. I’m OK with it since they were both signed up for the race and completed the full distance, but I understand that viewpoint. You’re allowed to run in groups in ultramarathons. A pacer is someone who runs only part of the race in support of an actual racer. By your standard, ObjectiveRunner, then the five men who led the race for the first 25 miles together should be disqualified as well. This is not like bike racing where you have drafting policies/penalties. Do you want to become the “pacing” police and jump out of the woods and break up people running together? Completely ludicrous and packs run together all the time in racing. In this case they simply decided at the end not to sprint it in because it didn’t matter, to them, which one finished ahead of the other. It’s not like Kaci was in the race to pace Magda. If you listen to their post-race interview, they both admit that Kaci was helping Magda to secure a golden ticket. Kaci at one point even describes how she really wanted Magda to get that spot to western states, and they made an intentional decision at the halfway point to work together for the second half of the race. This was not just two random runners nearby each other during the race — it was Kaci pacing Magda to a golden ticket. They admit it in their interview. It doesn’t get any clearer than that. Mark – the five men in the lead pack were not intentionally helping each other for a podium spot. That’s a completely different scenario. Not only was I at the race to witness in person, but their post-race interviews confirm that they were running aggressively from start to finish. Sage was even looking over his shoulder the last 4 miles to make sure no one was going to catch him, and 3 of the lead runners had to drop because they couldn’t keep up. I appreciate your words and understand it is indeed a race, however under these circumstances sportsmanship won over competitiveness. Having run with Magda step for step for 50 miles, why would it matter if one of us outkicked each other in the final mile? It was not what either of us desired. I wanted to be there seeing her earn that Golden Ticket and celebrate with her at the finish!! That’s why we tied. It’s our race and the way we decided to finish. I hope you can accept that. Kaci, I thought it was a class act the way you and Magda raced. Congratulations to both of you. While I thoroughly support the tie (and Kaci! ), this is a bad argument. No one observes competition and thinks lack of sportsmanship. And if either broke away in the last mile without letting the other know, that’s just lying rather than competition. This is more about Kaci and Magda doing what they want to do, so that’s pretty much the end of it. You’ve rather missed the point: It doesn’t matter how they ran their race, some legend in his own lunchbox from the internet would have an issue with it. Otherwise we’re in complete agreement. I’m probably old-fashioned, but could we avoid platitudes like “Haters just gotta hate”? First, it flippantly dismisses mostly thoughtful and respectful criticisms. Second, words like ” hate” carry real meaning and probably should not be carelessly tossed about. I did not at all interpret any of the critical comments to imply hatred for Kaci or Magda. I take your point on the use of platitudes. Hate is a word with an array of meanings, and as you point out my use of the word was idiomatic. That said, it was lazy of me and I apologise. However, it’s a fallacy that everyone is entitled to provide an opinion or that all such opinions ought carry equal weight. Two very talented women ran an ultra the way they saw fit: End of. Except it never is, is it? There is always someone with a keyboard willing to proffer an opinion on how they’re doing it wrong. It’s all rather tiring, frankly. Call me old-fashioned, but I prefer the sport when it’s a bunch of crazy people out having fun in the bush. Change is hard, I guess. Well, everyone is entitled to hold opinions, but you are right that not all opinions merit the same consideration. It’s pretty refreshing that opinions offered on irunfar generally are thoughtful and respectful, unlike many internet sites. And I guess for me it is mostly about having fun in the bush, because I’m rarely fast enough for anything else! These 5 comments above- the question that is asked and the way it is answered, and by whom, are a perfect summation of what makes ultrarunning, (and irunfar), such a wonderful island of sanity. I’m fairly certain that nobody who criticized you has put in 1,600 miles this year. Or been on the podium of such a competitive race. You had the ninth fastest time for women in the history of the event. Count me as another person who thought you raced well and I loved to see cooperation and sportsmanship. Congrats Kaci! my two cents: probably you are some competitive collegiate runner or more simply an angry road runner always looking at your chrono; well, personally i have nothing against this fact, but you are probably missing what trail running is about, and especially what ultra-trail running is about. It can appen someday, that you just want to enjoy the whole experience of a race, maybe you are not 100% fisically or mentally, or maybe you are searching for something different, that doesn’t mean that you aren’t pushing yourself at your maximum for the day, or that you are not aware of what racing is about. If you, instead, are an expert ultrarunner, you would know better than me that racing at your maximum level of performance during an ultra requires the right day (i would say the fortunate one) or you will bonk hard, getting some point of misery, wich in itself is not a bad thing, just an opportunity to learn something about yourself. Maybe in one of these days in which your shape or your race attitude are not at their best, you will like just to be outside, on beautiful trails, getting the better experience you can, even if you are a pro, even if you could win that race or try till you bonk. Maybe you will enjoy this different modality of racing, maybe you will get some fun, and it will be even more painful to hold a slower pace than what you have predicted. BUT i don’t really think this is the case; you have two wonderful and generous athletes like Magdalena Boulet and Kaci Lickteig working togheter to push themselves, sharing their strenghts and weaknesses, sharing their pain and thoughts, but also racing and challenging themselves without forgetting the beauty of the experience itself and however earning a second place in a supercompetitive race. Why should have they wasted their time, hours shared togheter, by sprinting against each other? In my opinion if you don’t understand this you don’t understand what trailrunning is about. I don’t know if i have pointed it out, but i’ve tried. Sorry for my english too. P.s. : congratulations to both Magda and Kaci! * the opening “you” was obviously referred to trevor and Stan Lie. How is it possible that someone would take the time to comment on the decision of two top notch athletes to run their race as they so desired? What silly people to waste time and space to say hurtful things with no good reason whatsoever. It has zero effect on your life! I was working the Madrone aid station when word came through about the tie we cheered. Bravo to two powerful women who ran an incredible race. Good job to everyone who ran the relentless wonder. Count me among the disappointed that there was no competition for 2nd place. Much easier to hold hands though. If it had been a gritty battle for second place, I doubt anyone would have been complaining about the lack of comradery. You can’t glorify these athletes’ fierce competitive drive one week and then imply that there’s little real value in fighting for a place the next. Great points. I was also a bit disappointed by the Killian/Jason handholding last year. I think it makes an event like Barkley that much more spectacular since top competitors cannot enter the last loop together and I certainly don’t see it as ‘unsportsmanlike’. What exactly happened to the Bak, Hazen, Smyth, etc that all dropped? They dug themselves into big holes early on and couldn’t continue, or they dropped with injuries? Thanks! Bak had a flare up of a previous Achilles injury. I think Hazen’s problems were in the nutrition/hydration realm. No clue on what happened to Smyth. He looked fine in fourth when I saw him about 100 meters before he dropped out. Do you really think that by not running together, one of them would have been 17 minutes slower? Look at the gap between 2nd/3rd place and 4th; who cares if one finished before the other? The end result would have been the same. I guess I should have been disqualified in every race where I ran with another female for more than a mile. Some days are so much better when you work as a team than if you were apart by a few minutes even if the end time is exactly the same. I won a 50K race a few years ago, and a buddy of mine (a guy) ended up falling into step with me in the first mile. We ran the entire race together, not because of planning, but we both had a better day as a result. Sometimes that happens, and that isn’t the same as having a pacer. Like someone else pointed out, no one paid money to come watch this event. You seen owed anything by these amazing athletes. They are free to run as they see fit, and I find this whole argument ridiculous. 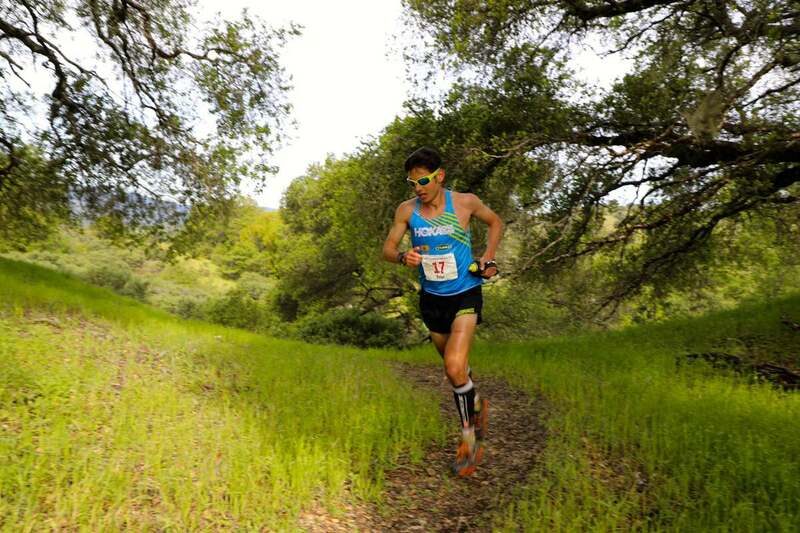 Should Kilian and Jason have been disqualified from Hardrock as well? I think it’s entirely possible that in a 50 mile event one of them could have been 17 minutes slower and thus, could have ended up in the fourth spot or worse yet even dropped! Anyone who has run with someone for that long, be it a pacer or a fellow competitor has witnessed the bystander effect first hand I think? Count me in the camp as someone who is totally cool with what they did as they get to run their own race but I also understand the different viewpoints. That’s the beauty, normally, of these discussions and why it’s not the letsrun.com messageboards. We can thoughtfully discuss without throwing around words like “silly” and “hate”. I’ve been sitting back watching the comments come in and there have been just as many, if not more, comments from those in the ‘pro Kaci and Magda camp’ that have been arguably insulting to the different opinions of others. We are all smart and passionate runners and can disagree from time-to-time without insulting each other I hope. I applaud Kaci and Magda for running into the finish together. It’s their race and they are allowed to enjoy it as they see fit, good for them. It’s a special moment crossing the finish line with a fellow competitor after suffering for that long on the trails! Hypothetical question though, what happens in this scenario if none of the top three women (YiOu, Kaci, Magda) have a Western States spot? Would YiOu, Kaci, and Magda all get Golden Tickets? What are the rules on that? Kaci already had a spot, so she was irrelavant in the race for a ticket. I know Kaci already had a spot, that’s why it was a hypothetical question. What I’m wondering is what happens in a Golden Ticket race when the top three don’t have a WS100 spot yet, and two people tie for second? Would all three in that scenario get a Golden Ticket? If all three get a ticket in that scenario, then hypothetically the second and third place racers could come to an agreement mid-race to tie so they both are awarded Golden Tickets. Is there any rule about this? right, funny thing is. And although a different race, Jason and Killian both get auto HR entries next year. It’s all good if you want to tie, but don’t let me try and fool you and think I’m gonna tie across the line. :-) I wonder if WS has a clause about that. If not, I bet they will next year. Go run. As the Race Director, I have no issues whatsoever with a tie. They both were entered, so neither was a pacer. A pacer would be a non-entered runner, as at Western States. They both posted very strong performances, ninth best ever on a day where the conditions had elite runners running ~10 minutes slower than previous years where the trails were mostly dry. Had Courtney caught up with them, the dynamics would have changed dramatically – with YiOu several minutes ahead, there would have been only one Golden Ticket for two women. But she didn’t, further testimony to the fact that – even if they were running together – they were racing. You don’t just waltz along and stay ahead of Courtney Dauwalter. More to the point here: Kaci and Magda are two of the classiest, most exemplary runners in our sport. They have earned the right to race in any fashion that they want. Magda & Kaci—awesome job! Loved watching your interview. Can’t wait to see you both race at States. Bryon and Meghan—Just out of curiosity, was there this strong of a reaction when Killian and Jason tied at Hardrock? I don’t follow Kaci’s comment that this is case of ‘sportsmanship over competitiveness’. Why is running for a tie more more sportsman-like than making an effort to win 2nd place? For the record I made an very similar comment about Killian’s decision not to compete at that time. the argument that they were pacing each other is ridiculous. the intent of the rule was for outside runners to not pace a competitor. if it were otherwise, every competitor from the boston marathon would be dq’ed today. competitors race AND pace each other in every event, whether conscious or not. this happens all the time in ultras where runners will work together to achieve a better outcome, just like every runner who is reading this drafted and paced off another runner in an event. Should you feel so inclined, how about next year you hold hands and sprint to AS1, then borrow Errol’s van, load it up with Tropical John’s fine wine, drive down the end of some dirt road and spend the rest of the weekend getting blotto and posting pics — see what the peanut gallery has to say then? I think finishing together is not controversial whatsoever and shows great sportsmanship. For people who criticize, its likely they don’t have much experience actually running these type of events. Anyone looking for proofs that a society that has been deeply indoctrinated by the idea of Darwinian competition besting over all other human qualities so some people truly cannot see a person is first of all a being with empathy and compassion before she is a competitor you don’t have to go further than this post. And to double down on the doctrine (rather than accepting the simple fact that human nature promotes cooperation and that makes people really happy), they rationalise reasons such as the no pacer rule or else everyone will all held hands across the finish line. It’s a crazy world we live in.